- Founder/heir and their primary spouse must be memorialized per generation. 1 point each generation. - For every 3 unique traits that the Primary spouse brings into the family you gain 1 point. Last edited by cynicalbadger on August 31st, 2018, 6:05 am, edited 28 times in total. I left a comment on the blog, but I this legacy! Wow, you're going full speed ahead! I like your heir choice! simfulicious wrote: Wow, you're going full speed ahead! I like your heir choice! 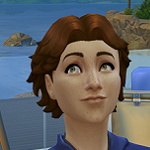 I've played ahead and Eleanor is currently making Generation 3 and they are cuties! Small update, but it's the start of Generation 2! Karter is a little bit yummy, in a bad boy kinda way! Way to go, Eleanor! EEEEEEEEEEEEEE I LOVE THE STORY YOU ARE SETTING UP FOR KARTER AND ELENOR. He's a alien, right. 'glowing', heh. Exxxxcellent. Dont apologize for your filler of an update, I thought it was great! 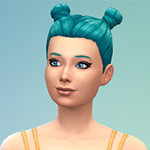 I want to start a legacy with a townie teen, thanks to you! @Sim: You definitely should, I feel like I'm more interested in this family because there is a bit of a history (not much and it really doesn't make a difference when actually playing) but I love Wolfgang and his legacy Thank you for your comment, you made my day! Rudyard is a great choice! He's pretty and he's blue...and pretty unskilled which means points! Nice spouse choice...and smart to knock her up before she can get away!